I have the desire to combine aesthetics, comfort and practice by combining shapes, colors, textures of different leathers and contrasts to give my bags “a little more” very current. Self-taught, it is out of passion for this noble and living material that I came to work on leather. Thus, since July 1982, I draw and realize entirely all my bags and small leather articles. I chose to use full-grain calf leather for its flexibility and performance over the years. These skins used to make the outside of my bags come mainly from Tanneries du Puy (43) and Tanneries Roux (26). The interior is lined with full grain Pécari leather of European origin. The seam is made of nylon thread and the metal zippers. It was in Biot that I found the good professional and family balance that allowed me to create, manufacture, present and sell my work, together with my wife and collaborator Muriel. At first, we had a workshop in different remote places and presented our creations in exhibitions and exhibitions (in Paris and its region, in the south of France and in Artisa Grenoble). 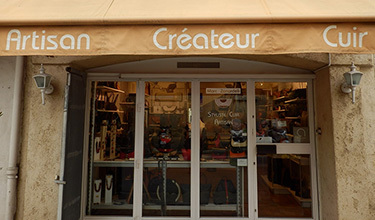 In 1987, we chose to have a workshop-shop, in Castillon, in the Alpes-Maritimes, where I made all the models in front of the visitors and my wife sold them on the spot. In 2000, we moved to Biot (06), to continue our work of manufacturing and direct sales in our workshop-store. This village on a human scale is ideally located close to Cannes and Nice, between sea and mountains. My path rich in experiences made me aware of materials, shapes, associations of colors. We manufacture ourselves and manually our bags and other items. These are unique pieces. It can thus slip very slight differences between the images proposed on this site and the models produced. The photos of this site are not contractual. All our models are registered.